When preparing for a new baby there are so many things to think about! It’s so easy to get caught up in the registry and all the adorable baby stuff. I wanted to register for everything under the sun! But there are some things that barely get used and can save you some money or allow you to put other things on your registry if you are able to get them from someone else. So don’t shy away from hand me downs! Take all the things you can get. We took everything that we possibly could from other people! It helped us out so much because it allowed us to splurge in other areas, like on the baby monitor that we really wanted. As always, you should check the recalls on these products and never use anything with your baby that you feel uncomfortable using or that is unsafe. Always inspect the products and use your good judgement. Strollers can be very expensive and they are very bulky. Once your baby is old enough to hold up their head, you will probably not use the big stroller anymore. If you have friends that have strollers that are in good condition, I would definitely recommend getting this item from them. Most people shy away from this because of the infant carseat and the fact that they don’t click in to every stroller. But in California as of January 1, 2017, you will need to keep your child rear facing until they are 2 years old. This means your baby will outgrow the infant carseat and you will need to buy a convertible one. We opted to just buy a convertible carseat from the get go, and so it doesn’t matter which stroller we have. Swings can be make or break for your baby. They may love it and use it everyday, or they may hate it and it may just be something that gathers dust in the corner. On top of that, most swings have a weight limit of around 15-25 pounds. It’s also recommended that you stop using a swing once your child can roll over or push up. This means, that if your baby likes the swing, you will only use it for about 6 months. Considering swings cost upwards of $100, this seems like a lot of money for such a short period of time. If you can get this from someone else, I would definitely take them up on it! We had a very specific monitor that we wanted, but I still took people up their old baby monitors. I liked to have a back up, in case for some reason the one we purchased stopped working. Also, I wanted to keep an extra baby monitor at my moms house. If you have a place where your baby will be spending time, such as a baby sitter, your parents, or even a second house or motorhome, and it’s not important to have a top of the line monitor, consider taking baby monitors from friends that can be used at those locations. I love knowing I won’t have to drag the baby monitor with us when we go places. Most people will tell you to take all the hand me down clothes you can get. Babies grow so quickly and they soil everything. You don’t want to spend a lot of money on tons of new clothes that they may not even get to wear, or will only wear once. People will probably also buy you lots of clothes, for the baby shower and just because. Everyone loves to buy baby outfits! So if you can get hand me downs and new clothes as gifts, you probably won’t have to buy very many at all. Swaddles can be pretty expensive, and most babies only want to be swaddled for the first couple months. This means that people probably have swaddles in good condition they are willing to get rid of. Swaddles are also pretty gender neutral, which is a plus. So go ask all your friends who recently had babies what they are willing to get rid of! You can even start a trade cycle and plan on sending all your hand me downs to the next new mom in the group. That way you all benefit and they don’t have to hold on to things they might now use in the new future. There is probably much more that I could add to this list! There are so many things that baby needs and while its important to buy some things new, there are others that just don’t matter. 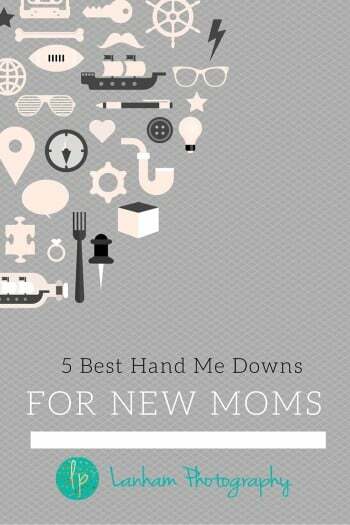 What were your favorite hand me downs as a new mom? Were there things you just refused to reuse? I know some people don’t like hand me downs, but I definitely embrace and welcome them!